Welcome to Funtastic Mobile Video Games and more! 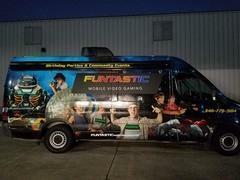 The hottest Mobile Video Game Truck on wheels, the Funtastic Mobile Video Game Van is available for birthday parties, events, fundraisers, schools, corporate team building, festivals or anytime you just want to get your gaming on! Proudly serving the Houston areas. Mobile Video Games Are Fun For All! Check out the video to the right to learn a bit more about Funtastic Mobile Video Games. My kids played until they couldn't see straight. Best time they had in years. Renting again next year for sure! We needed to rent fantastic mobile video games and only gave a 24 hour notice. Funtastic Mobile Video Games made it happen! Funtastic Mobile Video Games bring the Excitement! We bring the Ultimate Gaming experience right to your front door! Our luxury, Van theater on wheels features 5 widescreen high-definition TVs, surround sound and seats with built-in vibrating motors synced to the on-screen action. This is multiplayer gaming heaven! 12 can play at the same time with room for 8 more friends on the second row of stadium seating! We have all the latest titles from Xbox 1, Wii, and Playstation 4, PS 3 and X BOX 360. Planning a Summer or Winter Party? We are climate controlled! Our Referees and Game Coach will make sure the kids have a blast and the parents get a break! 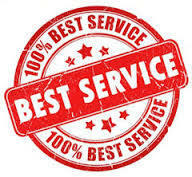 We are the solution to your next event whether it's a birthday party, fundraiser or play date with your best friends. We'll do all of the work! No cleaning up before guests arrive or after they leave. Looking for a Party the kids will talk about for years? Pizza Parties and Bowling Parties are a thing of the past. Be the first to have us roll into your neighborhood. If you're looking for party ideas for a teen party, a kid's birthday party, a bachelor party, adult get-together or church or school party, go with us! You'll be glad you did! Fantastic Mobile Video Games does not allow any food or drinks into the video game theater. Please have your guests consume them outside of the trailer prior to entering.